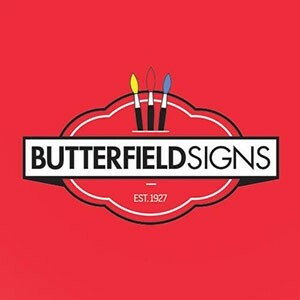 Butterfield Signs was founded by Mr. Harry Butterfield in 1927 and today has developed to become one of the largest and most respected sign makers in the United Kingdom. Operating out of 60,000.00 sq. ft. premises in Bradford, we employ approximately 150 people over a range of trades that are all carried out in-house. These comprise engineers, plastic and metal fabricators, vinyl and graphic technicians, spray painters and laser / metal operators, together with neon tube benders and signwriters, all supplemented by a host of managerial and secretarial skills needed in blending this business together. We offer a Nationwide service, operating a fleet of 24 vehicles together with 2 hi-ab/crane vehicles and a mobile platform, all managed by an on line tracking system providing real time vehicle information. Working to BS EN ISO 9002 we offer a full range of design and manufacturing skills. Using the most modern methods of manufacture and investing in the forefront of modern signmaking, our dedicated contract management approach ensures full attention is given to your requirements at every stage from design, planning applications, site surveys, through to manufacture, installation and maintenance.